What is a neighbourhood? What holds it together? What tears it apart? A geography, social networks, resources such as parks and schools, gardens and community centres, shops (butcher, baker, coffee shop, hairdresser, barber), church or temple, synagogue or mosque, the houses next door across the lane or over the road, sidewalks, trees, fences and hedges, dogs and cats, bikes and wagons, cars whispering home in the early morning, sunrise or rainfall ― and, of course, people and their voices: the friends next door, the characters up the street, dog-walkers, cat-lovers, and those who lean on and talk over the back fence. Builders, sales people knocking on doors, postmen and milkmen, nannies pushing buggies, whistlers and the kid with a new set of drums. There is the underside, too: competition, bias, hunger, bureaucrats, community meetings about housing and pothole repair, recycling and welfare. The human comedy. The challenges of looking after children; and the edges: pawn shops, hospitals, policing and fire halls. Then you hear the voices: the builder offering advice, the social theorist ordering coffee, the social worker on a 10k run, and the psychiatrist who visits a psychiatrist. There are quiet moments here: the landscape, the change of seasons, shared meals and the multiple cultural celebrations; and change itself: age, disappearance, fog, tide, weeds, demolition, rebuilding, ghosts. What you hear and what you don’t hear; all are present in the spoken and unspoken of the near dwellers. 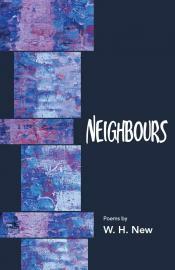 Neighbours is a book that affirms; we are all neighbours, wherever we live. Following YVR, with its exploration of Vancouver, W. H. New gives shape and sound to the neighbourhood in a voice that is gentle, witty, apprehensive, and tender. These are poems that dare to bridge the vast space between the familiar and the mysterious; the eloquent and the colloquial.